Building inclusive engagement online to accelerate change today. Starting at the neighborhood and city level we go deep in our network of E-Democracy communities. Our goal is to discover how to inclusively engage the highest percentage of households in daily civic and community engagement online. In our strongest neighborhoods, over 30% of households participate. We also widely promote inclusive open government and civic technology innovation based on our 20 years of direct field experience. Local Community Forums - Defined by geography, local community forums strengthen communities by helping build strong relationships and providing a mechanism to explore solutions to local challenges. 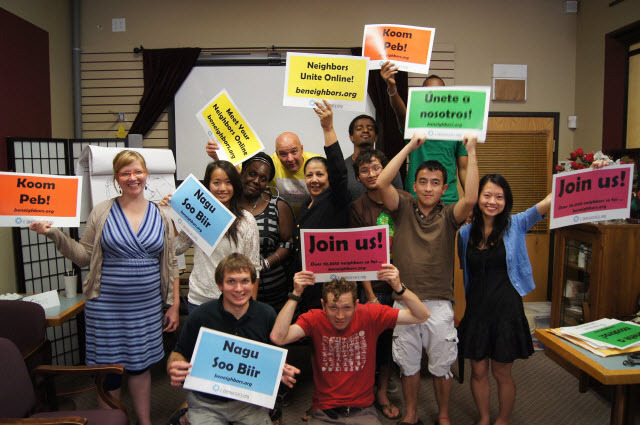 BeNeighbors - A three-year, Saint Paul-based inclusive community engagement online project funded by the Knight Foundation. Moving forward @newvoices. Inclusive Social Media - A two-year, Minneapolis-focuses inclusive community engagement online project funded by the Ford Foundation. Moving forward @BeNeighbors. Sunshine 2.0 - Indicators and resources to help local chapters of the League of Women Voters improve local support for democracy online. Civic Tech - Create opportunities for the 20,000+ inclusively recruited Twin Cities Neighbors Forum members to help civic coders identify ways to harness the power of open data to build strong communities. PublicMeetings.info - Standardizing and making public meeting data more accessible.